Would you like to learn how to pronounce Regular Past Tense Verbs? Keep reading, then. 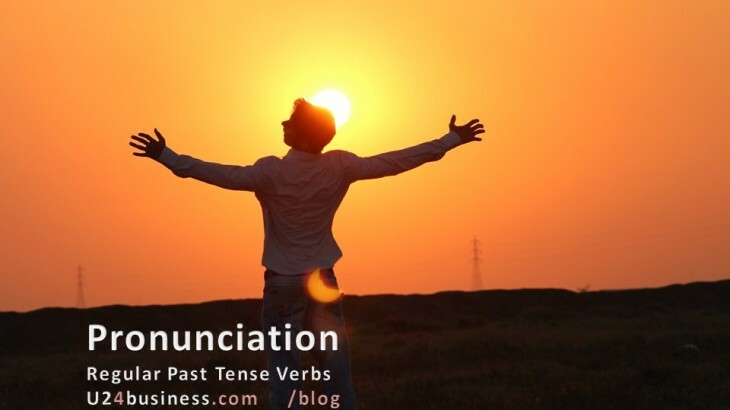 1- Pronounce / t / after all voiceless consonant sounds: / f, k, p, sh, ch, s, x, /, except / t /. 2- Pronounce / d / after all voiced consonant sounds: / b, g, j, l, m, n, r, v, z / and after vowels / a, e, i, o, u / , except / d /. 3- Pronounce / id / after / t / and / d /. When we say that the pronunciation of regular verbs depends on the verb word ending, we refer to its sound, not to its writing. /aprishieit/ (/əˈpriːʃieɪtɪd/), therefore we need to apply rule numer 3 referred to words ended with ‘t’ or ‘d’. Would you like to have a list of regular verbs? Just ask and we’ll be happy to oblige. Please share this post if you find it useful. Verbs aprender inglés, aprender inglés rápido, clases de inglés, clases de inglés a empresas, cómo se dice en inglés, inglés, inglés de negocios, inglés gratis, pronunciación, regular verbs, U24Business, verbos, verbos regularres, YouTooForBusiness. permalink.